1. Coffee and Conversation - monthly presentations on various topics such as "Great Walks with Lucy Tobias" and painting demonstration by nationally acclaimed Morgan Samuel Price. These are just a few of the gallery high lights from this past year. We have great plans for the coming year. Fabulous photographer Kent Weakly, Leslie Hammond from Artistic Eye and "Decorating for the Holidays" by a decorator from Koontz Furniture and Home Decor are just a few giving presentations at Coffee and Conversation. Oil painting classes, drawing salon and critique groups are also being considered. This is all in addition to our own busy show schedules. So, check back here from time to time to learn about our next adventure. Ocala is fortunate to have an organization that acts as an umbrella for all the arts in Marion County. Marion Cultural Alliance offers grant money to local non-profit arts organizations which helps greatly in their survival. Yesterday, these grants were presented at a sold-out luncheon at the Ocala Hilton. My heart lies with two dimensional art but I embrace all of the arts. It was invigorating to be among so many creative people - painters, actors, dancers, singers, musicians, directors, and the list goes on. This upcoming season is jam packed with so many cultural events it will be hard to pick which ones to attend. Not only do I live in a "post card" but also a haven for the arts. "Reflections" Oil on Canvas 8"x10"
Some of you have told me that it is difficult to keep up with the fast pace of my weekly "Post Cards from Paradise" auction of miniatures. Others have requested larger paintings in the auction. So, I have created a "Collectors Choice" auction for larger paintings and extended the auction period to one month. As many of you may know I enjoy kayaking the spring fed rivers in Florida. The painting shown here titled "Reflections" is the first to be offered in the "Collectors Choice" auction. 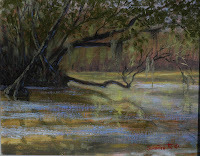 It was inspired by a photograph I took while paddling the Wekiva River in Apopka. This particular venue is on the Little Wekiva, an off-shoot of the main water way. If you have not been on this river I highly recommend you give it a try. Don't have your own boat? Just rent one at Wekiva Springs State Park. "Reflections" was shown as a preview to those who have subscribed to my email notices with information about exhibits, events, new reproductions and paintings. As a result, the starting bid of 99 Cents has climbed to $40.00 as the highest bid offered to this date. Everyone has had fun with the weekly auction, I sincerely hope this longer auction with a larger painting will be equally fun. As part of Marion County's 9th Annual Springs Festival with events throughout September, I have invited Documentary Photographer Richard Rossetto to speak at September's "Coffee and Conversation" at VoilART! Gallery. Richard has been exploring and capturing images of the springs for 20 years. 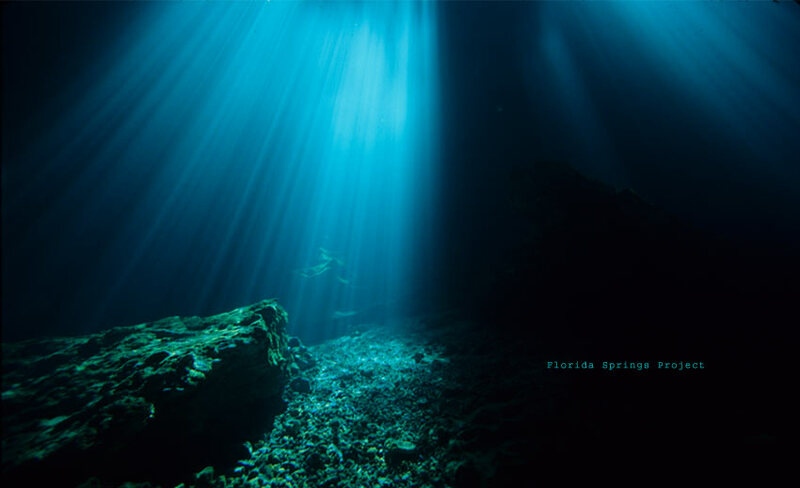 He is leading the Florida Springs Project, a photographic project about Florida's natural resource that chronicles his passionate journey to discover the magical and mysterious wonders of the ancient flow. Everyone is invited to this FREE presentation Wednesday, September 15, 2 - 4 pm at VoilART! Gallery, 108 E. Ft. King Street, Ocala, Florida. Florida has more freshwater springs than anywhere on earth. Come hear about the amazing 19 billion gallons a day of cool, pure crystal-clear water flow from the subterranean depths.